Haifa watercolors : for piano / Malcolm Williamson. The harbour at sunrise -- Herzl Street -- Ships at anchor -- Spring flowers on Mount Carmel -- The grotto of Eliyahu -- Bedouin shepherd and his black mountain goats -- Mount Hermon in the mist -- Flute dance -- The Kishon River -- The harbour at sunset. 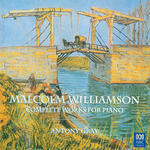 CD: Complete works for piano / Malcolm Williamson ; Antony Gray, piano.